Harvest Hill is a body of Christ and like all bodies it has a heartbeat giving it strength, life and love to the body and the surrounding community. 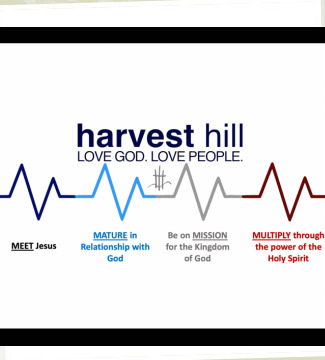 The Heartbeat of Harvest Hill is broken down into four components founded by the great commandments (Mark 12:29-31) and the great commission (Matthew 28:18-20). It is our desire that all people would meet Jesus Christ in a personal relationship through personal testimony, preaching, Biblical teaching or through a Christ-like lifestyle. We believe until an individual has met Jesus in a personal relationship they will not be capable of living their God-given purpose in life. All people who have met Jesus are to engage in personal discipleship, which means to grow in that relationship. This is done through personal Bible study, small groups, preaching of the Word and engaging in Christian conferences. This is not just to gain more knowledge but to know God more so we might love Him and others the way He commands us to. Every individual who is a Christian is called to be an ambassador, salt and light in this world. Every believer is called to be a part of a local body of Christ (the church) and to be an active part of that body. This is what makes a church a healthy church. Every believer is also called to be Christ's representative in and outside of the church. To be on mission is to be a part of God's mission in discipling, serving, ministering and going on mission; all for the glory of God's eternal kingdom. The beauty of having a relationship with God through Jesus Christ, is God gives all of His people His Holy Spirit to empower and enable them to do God's mission. Since it is God's will for all people to be saved (1 Tim. 2:4), we seek to mature and be on mission to mulitply God's message of salvation so others can meet Jesus and begin the heartbeat process.